Global Marine Species Assessment (GMSA) data, activities and partnerships with IUCN Species Specialist Groups have resulted in real world conservation success stories. Here are a few examples. Listings in CITES Appendix II – Internationally, results from IUCN Red List assessments have been used to increase protection for commercially exploited species of shark and manta ray. The landmark 2013 listing of seven marine species to Appendix II of the Convention on International Trade in Endangered Species of Wild Fauna and Flora (CITES) came into effect in September 2014. Appendix II is designed to protect internationally traded species that may not be currently threatened but could be at high risk of extinction unless trade is closely controlled. The seven species, including the oceanic whitetip shark; several hammerhead sharks; the porbeagle shark; and the reef and giant manta rays, are highly commercial, creating new challenges for the implementation of this listing. Under Appendix II, all specimens for international trade will have to be accompanied by permits, proving that the specimen was collected sustainably and legally, and be reported to the CITES Secretariat. Improved Marine Protected Areas for a Living Fossil – As a result of its recent listing on the IUCN Red List, the Sulawesi Coelacanth (Latimeria menadoensis) is currently protected under Indonesian fishing regulations with the recent ban on shark nets in the Bunaken National Park, as well as international trade protection under CITES. Coelacanths are considered to be a “living fossils,” as they were thought to be extinct since the end of the Cretaceous period, until a specimen was found off the coast of South Africa in 1938. 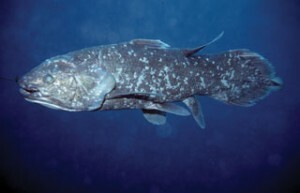 The Sulawesi Coelacanth, which is only currently known from three locations off the coast of Sulawesi, Indonesia, is listed as Vulnerable given its life history, predicted small population size, and susceptibility to several threats, including collection for the aquarium trade, capture as bycatch in deep shark nets, and by hook and line fisheries that target deepwater snapper. Ban on Shark Finning in the Eastern Pacific – Information on the population and conservation status of the world’s shark and ray species, collated by the IUCN Shark Specialist Group with the help of the GMSA, is critical to improving protection for sharks around the world. Regulation OSP-05-11, agreed to in November 2011 and effective 1 January 2012, was adopted via SICA’s Fisheries and Aquaculture Sector Organization of the Central American Isthmus (OSPESCA). It binds Belize, Costa Rica, Dominican Republic, El Salvador, Guatemala, Honduras, Nicaragua and Panama. These nations support total or seasonal closures for shark finning.